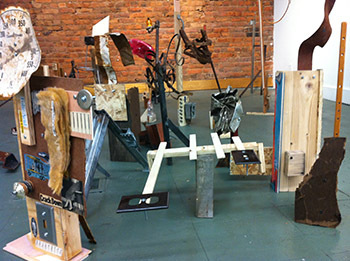 A sculpture by Holly Wilson for the “FULL” exhibition. “FULL,” an exhibition of work by undergraduate sculpture students in the College of Visual and Performing Arts’ (VPA) Department of Art, will be held Oct. 9-Nov. 3 at XL Projects, 307–313 S. Clinton St., Syracuse. The show is free and open to the public. A reception will be held on Thursday, Oct. 17, from 6-8 p.m. Regular gallery hours are Wednesday-Sunday, noon-6 p.m. For more information, contact Andrew Havenhand at ahavenhand@yahoo.com. XL Projects may be contacted at 315-442-2542 during gallery hours.